This page contains videos of several installations of PileMedic™. You can click on the YouTube link, whereby the video as stored on www.YouTube.com will play. Alternatively, in some cases, the video of the installation may be available on this website. For those whose browser cannot access YouTube, this provides an alternative way to watch the video. Wooden Utility Poles as shown here can be repaired by spiral winding a 12 inch band of PileMedic laminate and epoxying it to itself (not shown here) to create a solid shell that can be filled with resin. Reinforced Concrete Bridge Piers like this one in San Luis Obispo, CA can be repaired by applying QuakeWrap carbon fabric saturated with epoxy resin. 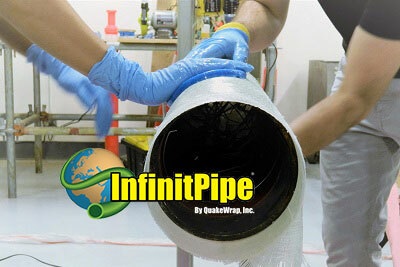 The jacket strengthens the column and stops the flow of oxygen, bringing the corrosion rate to a near halt!